Oibo is an elastic, stackable, rollable, squeezable, easy-to-grip sensory toy for babies and kids of all ages. 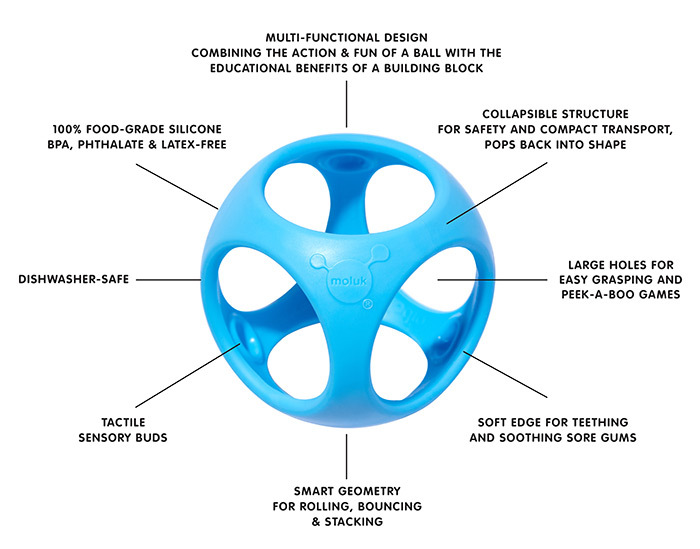 Oibo’s geometry merges a sphere with a cube - combining the action and fun of a ball with the educational benefits of building blocks. Like all MOLUK toys, Oibo grows with the child. It shines as an elegant grasping and teething toy for the baby. Toddlers will enjoy how Oibo bounces and rolls. Its soft material is perfect for first throwing and catching games. By stacking and aligning the pieces, kids learn about geometry while training hand-eye coordination and fine motor skills. Oibo collapses when you accidentally step on it and pops right back into shape. Nigi, Nagi & Nogi are soothing your baby’s sore gums without being an eyesore. Made of 100% food-grade silicone rubber, MOLUK’s new teething rings are easy for small hands to hold and offer essential tactile and visual stimulation. They remain interesting as multi-sensory fidget toys when the child grows older and work together with the other parts of the MOLUK family for years of open-ended, child-directed play.